I’ve been down on my luck before, sure. We all have, at one time or another. And I’ve played the game too many times of “Okay, so how am I gonna pay my rent this month?” I’ve sold things and taken on extra work, but I’ve been relatively lucky. I’ve never had to cook for demons. Matt Wallace’s Envy of Angels, the first novella in the Sin du Jour series published by Tor.com, starts just there. Out of work chefs Lena and Darren get lucrative offers of employment from Bronko Luck, a presumed-dead celebrity chef, to cook at the mysterious catering company Sin du Jour. As they’re introduced to the unusual crew and wander into dark pantries stocked with some very bizarre ingredients (“do not open” really does mean DO NOT OPEN), they are left to wonder if they’re up for the rigors of fine dining for creatures of the underworld. However, even six-foot-tall insects, severed arms and dogs fluent in demon-speak aren’t going to deter this duo of derring-do from rolling up their sleeves, slipping out their knives and trying to get a handle on this mess hall from hell. Wallace sets the table with a deft skill, laying out course after course of delightful scenes and dangerous characters. We meet the members of the Stocking and Receiving Department, a crack team tasked with tracking down the rarest of supernatural additives needed for the out-of-this-world dishes. And then there’s Mr. Allensworth, the enigmatic government spook with a penchant for track suits who provides the ethically-questionable main course ingredient, thus providing the main conundrum for everyone involved. Plot, character development and backstory are so tightly woven and quickly spun-out that I was left breathless, and desperately turning the page for the next delectable sentence. There’s no shortage of sass and snark, either. Ryland, the alcoholic alchemist (because really, would there be any other kind) made me chortle with glee, and Ritter, the leader of Sin du Jour’s answer to the A-Team, has no equal when it comes to sarcastic retorts. Throw in a clown named Redman Britches, terrifying and absurd in equal measure, and I was enchanted by Wallace’s quirky sensibilities. But the funny doesn’t just come from the characters: it permeates the whole delicious dish. I found myself in wonder at the kind of mind that would take such twisted and imaginative paths. In the Sin du Jour world, magic, technology, and religion co-exist, and are all a bit messy and wholly surprising. The sense that lingers, however, is that of enormous heart. At several points, Wallace took my heart, showed it to me, and cleaved it in two. But in such a way that I knew it was a necessary thing, and thanked him for the cut. This is where rare skill is shown, when a writer can make you grateful for the pain. There is a sort of brightness that is distilled through tragedy, and a gentleness that rises only from wounds of the worst kind. This all informs the rich world that Wallace has crafted, and it left me gloriously full and hungry for the next meal. Envy of Angels is, quite simply, ambrosia made up of equal parts beatific wonderment, barking laughter and so, so much nightmare fuel. Each bite of this book is perfectly balanced; action, intrigue, heart and humor. 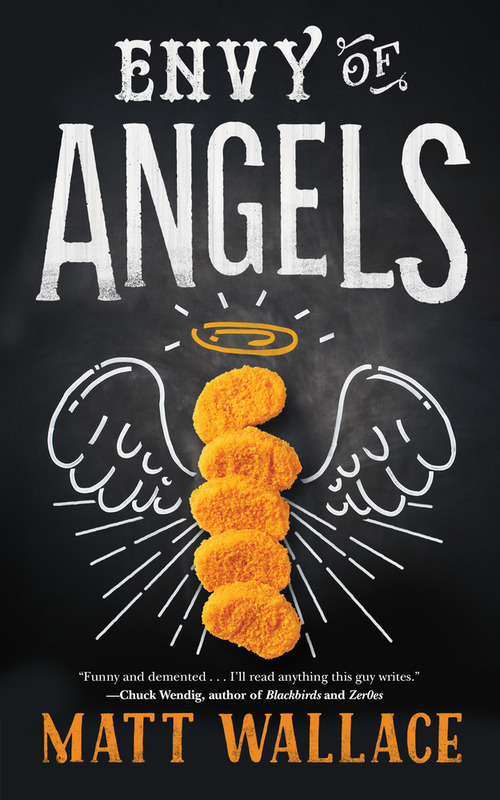 Whet your appetite, because Matt Wallace’s Envy of Angels delivers.